You think you know what to expect when you visit the Outer Hebrides: sandy beaches, purple heather, other-worldly standing stones. All those things are waiting for you – but there’s a lot more to these Scottish islands than the media (and Instagram) would have you believe. First things first: you will need a car. Unless you’re visiting the Outer Hebrides as part of a tour group, it’s a good idea to bring or hire a car. Yes, there is a public bus service (as you can see from the bus stop above! ), but it won’t allow you to truly experience everything the islands have to offer, or give you the freedom to stop and pause when something catches your eye during your journey. And you’ll need to get used to single track roads, too. Use the designated passing places to allow faster cars to overtake you, or to move out of the way of a car coming towards you. Whatever you do, don’t block the roads! Talking of cars, in rural areas, sheep often rule the road. 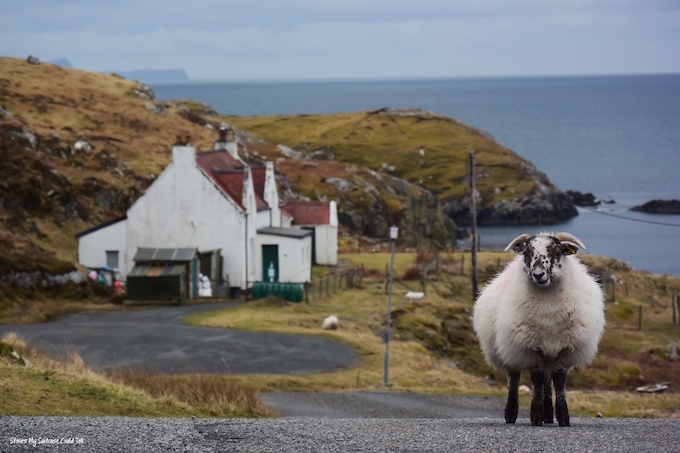 I have a particular fondness for the sheep in Harris; every time I drive around the island there are always some who decide to do a stand-off with me in the car, steadfastly refusing to move onto the verge or into a croft. It’s also important to remember that if you see a crofter moving his sheep (or cows) from one field to another, don’t try and rush past or hurry them along; you’ll frighten the animals, and make the whole process take even longer. I saw this last summer in Harris, as we slowly drove behind a crofter and a flock of sheep, only for two cyclists to come racing along in the opposite direction without a backwards glance, scattering the poor animals everywhere. Be patient, and let the crofters get on with their job. Don’t worry: the food is excellent. The UK, and Scotland in particular, seem to have an outdated reputation for serving up unappetising meals. Well, you don’t need to worry about that here! 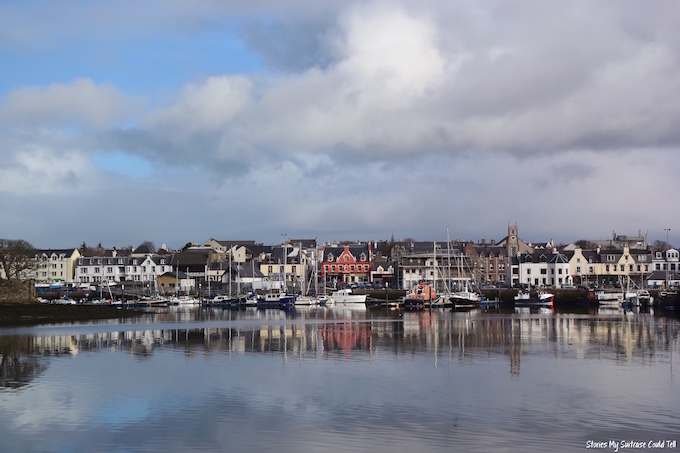 Whether you’re enjoying the local speciality that is Stornoway Black Pudding or getting a picnic from 40 North, indulging in fresh seafood or a wee dram at the Harris Distillery or in McNeill’s, there’s plenty to whet your appetite in the islands. …which means you don’t need to stock up on provisions before you arrive. Tourism is an important part of the local economy, and that includes visitor money being spent in shops, restaurants, and pubs. 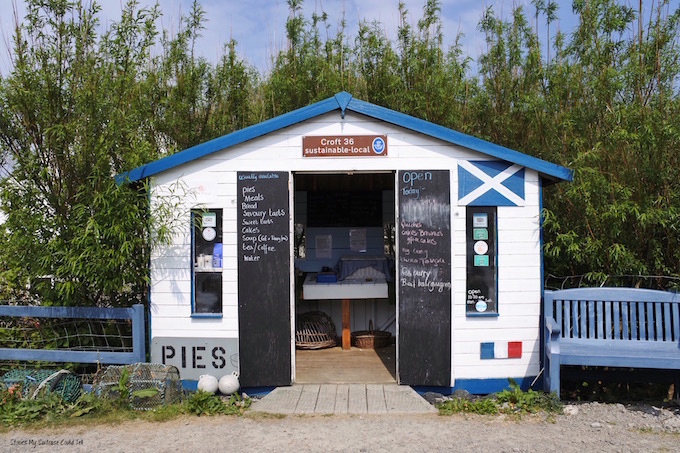 A few years ago stories surfaced of tourist information offices and B&B owners on the mainland telling visitors that they couldn’t get food in the Hebrides, and that they should buy all their supermarket provisions before boarding the ferry. Aside from the fact that this is simply isn’t true – there are major supermarkets and small local shops dotted throughout the islands – there’s also a bounty of fresh, local food to choose from, whether you’re eating in a restaurant or staying in self-catering accommodation. Seriously: once you’ve tasted the fresh eggs from Air an Lot in Ness, you’ll never be able to eat a supermarket egg again! Shops are (mostly) closed on Sunday. 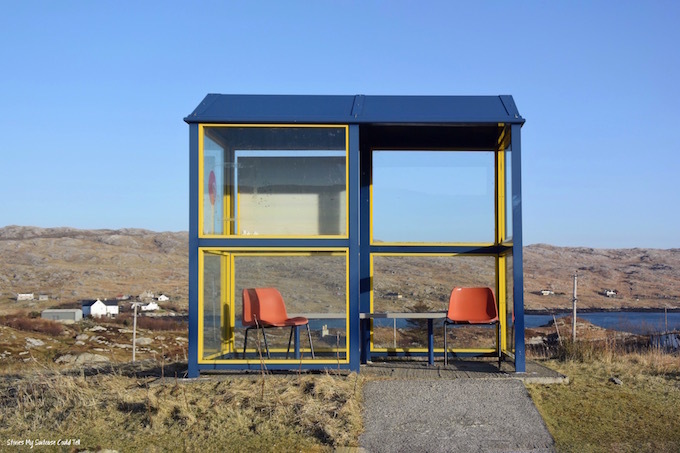 Yes, the rumours are true: the majority of supermarkets and shops in Lewis, Harris, and North Uist are closed on Sundays. But that doesn’t mean you’ll go hungry – there are still plenty of takeaway and restaurant options to choose from, and convenience stores open in Stornoway. But when they’re open, you’ll want to invest in some local souvenirs, so leave some space in your suitcase! 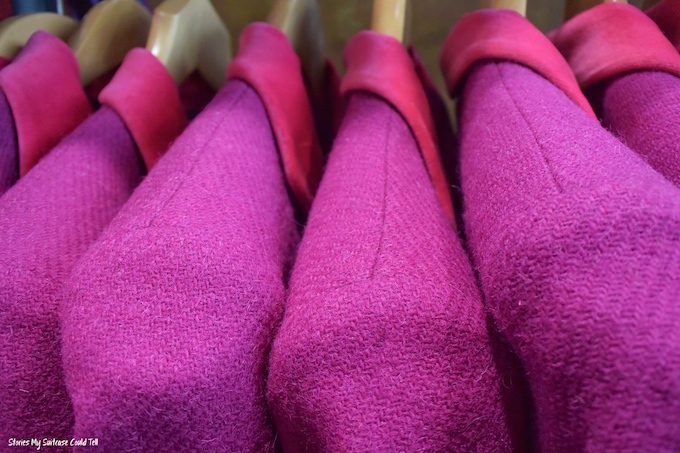 Whether it’s a new Harris Tweed coat (or bag, or blazer); some art from Buth Lisa in Ness or the Coralbox in Berneray; trinkets from Hebridean Jewellery in South Uist; or island-inspired candles from Essence of Harris, there’s plenty to choose from when it comes to investing in physical reminders of your holiday. 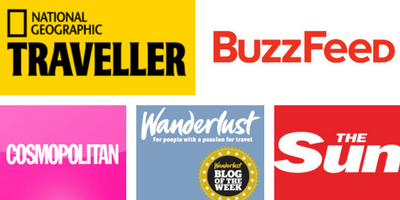 Take my advice, and leave some space in your suitcase for more than stories! 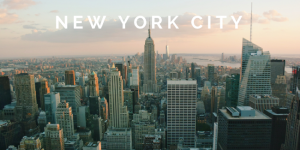 You can (and probably will) experience four seasons in one day. So make sure you pack appropriately (but don’t go overboard). You can usually spot the first-time visitors to the islands – the ones who didn’t know quite what to pack for visiting the Outer Hebrides. There are some dressed like they’re going on an Kenyan safari, all in green with the hats to match, and others wrapped up so warm they look as if they’re getting ready to tackle an Antarctic expedition. I get it: knowing what to pack for a destination with weather as unpredictable as the Outer Hebrides is tricky, but if you stick with what you usually wear on a regular day, make sure you take a variety of layers, and pack a waterproof jacket for when it rains, you should be fine. If things get really bad, you can always buy a pair of wellington boots on location! And ferry and flights times are subject to the whims of the weather. While there are usually multiple flights a day to the main Scottish cities, and a couple of ferry runs a day from (and between) multiple islands, the weather can disrupt schedules, particularly in the winter. 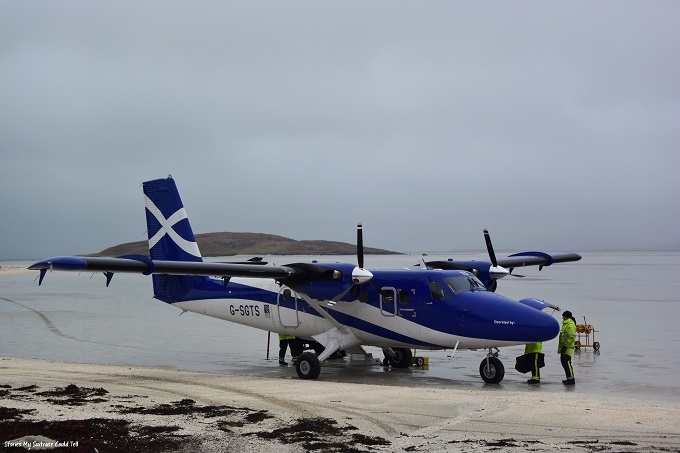 And in Barra, where the plane lands on the world’s only commercial runway that doubles as a beach, tides determine the timetable on any day of year. Your best bet is always to book ahead – especially in the busier summer months – and keep an eye on the news for any updates. You’ll hear (and see) Gaelic a lot. The Hebrides are often referred to as the Gaelic heartland, the location with the highest concentration of Gaelic speakers in the world. 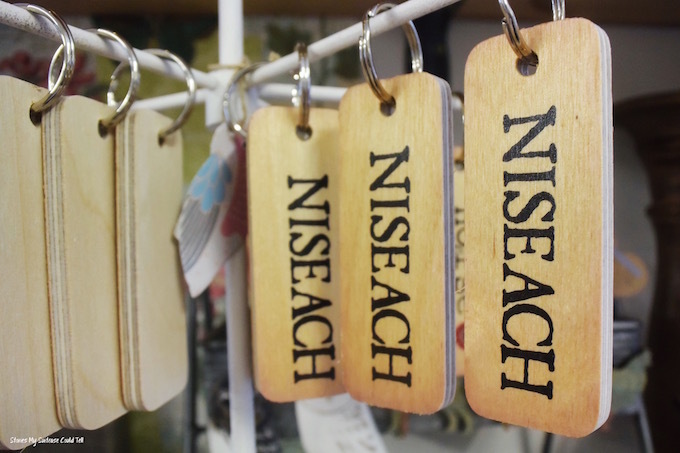 Locals still speak it, and you’ll come across road and street signs in Gaelic first (and sometimes in Gaelic only). But don’t worry, everyone speaks English too, so if you’re confused by something, just ask. And in the meantime, enjoy the lovely sound of the local language! 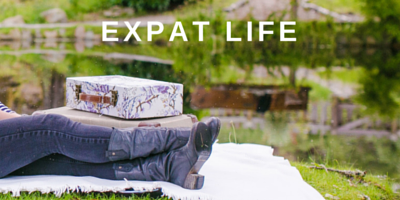 …because despite appearances, we’re not completely off the grid. Although wifi is easily available, mobile internet is not, but why worry? You didn’t come here to spend your day on Facebook, so put that phone on airplane mode and go outside to actually explore the place you came to see. On that note: islanders don’t live in the dark ages. 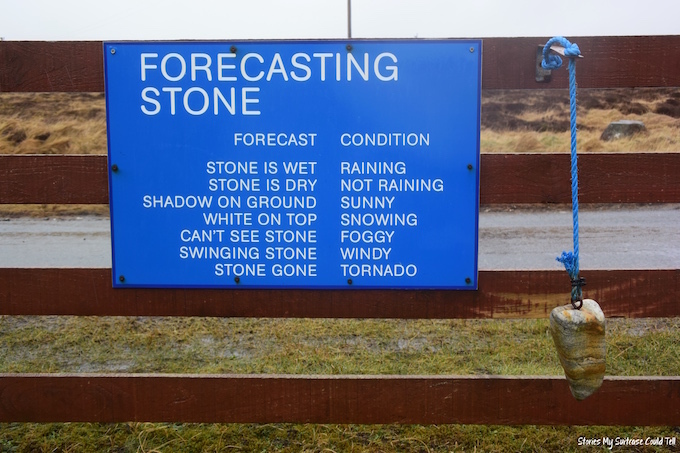 Given the often stereotypical depiction of the islands in the media (which I’ve written about before), I suppose it’s unsurprising that some tourists arrive with rather skewed notions of what life in the Outer Hebrides is like. As long as you do your research in advance – like you would before travelling to any destination – and you’ll be less likely to offend anyone, and more likely to enjoy your holiday. 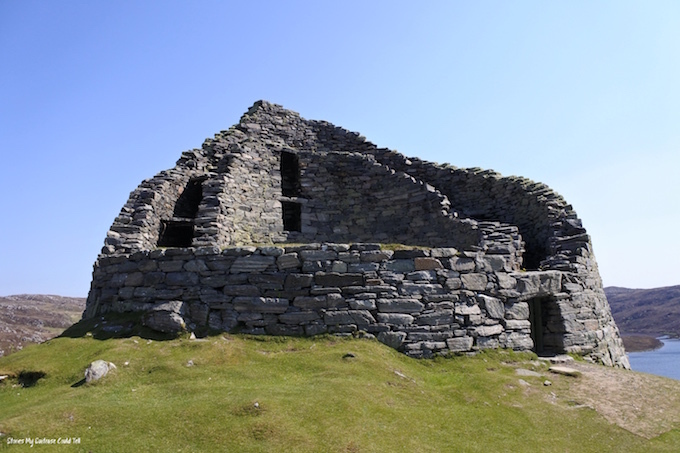 There’s more to see than the Callanish stones and sandy beaches. 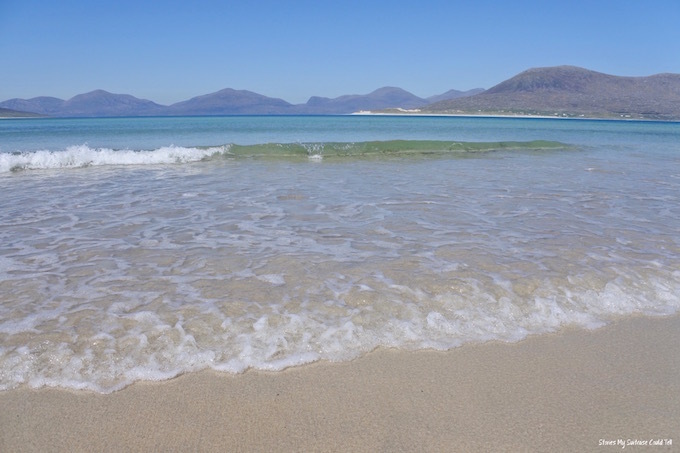 While they are undoubted highlights (Luskentyre and Seilebost beaches take my breath away every single time I see them), these islands have a wealth of experiences to offer. 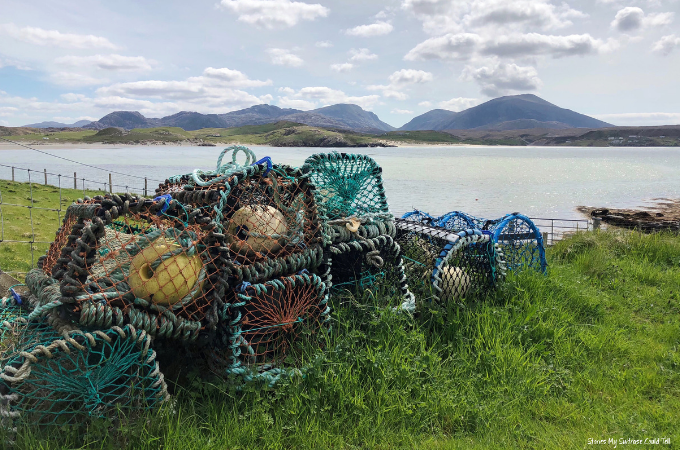 Whether you’re discovering Jacobite history in Eriskay, or getting a taste of croft life in Ness, sailing to a cluster of outlying islands like the Shiants, or listening to live music on a summer weekend in McNeill’s, there’s much more to do here than meets the eye. Get away from the Instagram hot spots and you’ll be more likely to experience the real Outer Hebrides. And finally? 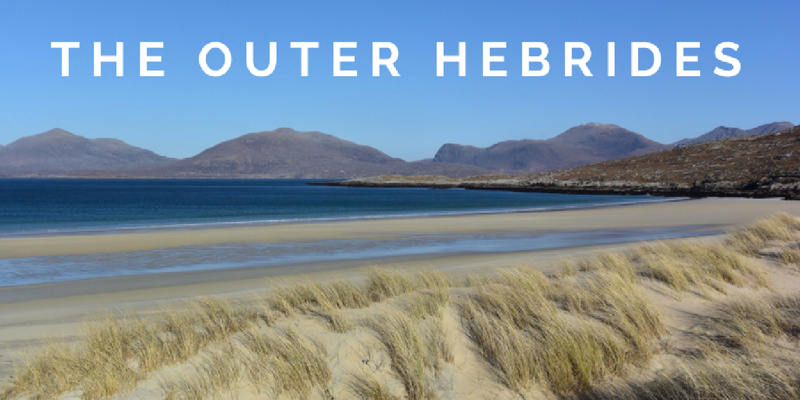 Once you’ve experienced the Outer Hebrides, you won’t be able to stay away! 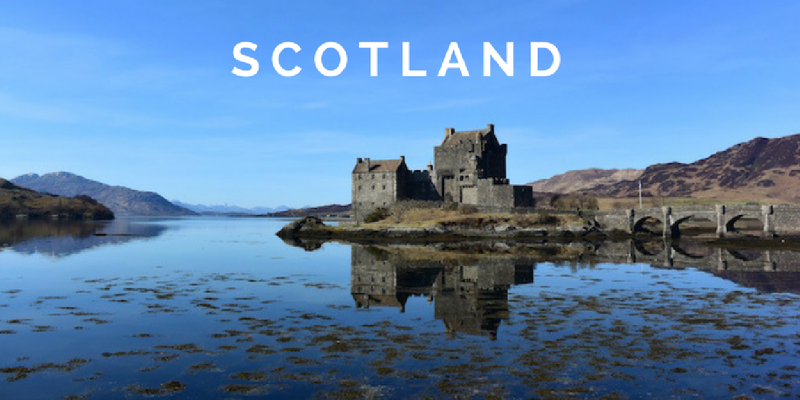 In the words of best-selling author Peter May (who has written multiple bestselling books about the Outer Hebrides), “these islands have a way of getting under your skin and into your blood.” So why not book that plane (or ferry) ticket, and see the Outer Hebrides for yourself? You won’t regret it. Have you ever visited the Outer Hebrides? What useful advice would you add to this list? Let me know in the comments – I’d love to hear from you! Absolutely spot-on advice, Katie. I’d like to double, triple, quadruple your statement about the superb food to be had in the islands. When I was there, I can honestly say that in every restaurant or cafe where I ate, the food was more than delicious, it was exquisite. Eriskay scallops the size of your fist at the Polochar Inn, fresh salmon and beetroot salsa in Harris and the freshest fish and chips I’ve ever had in Tarbet. Hope your new job is giving you lots of joy. Thanks, Marilyn! 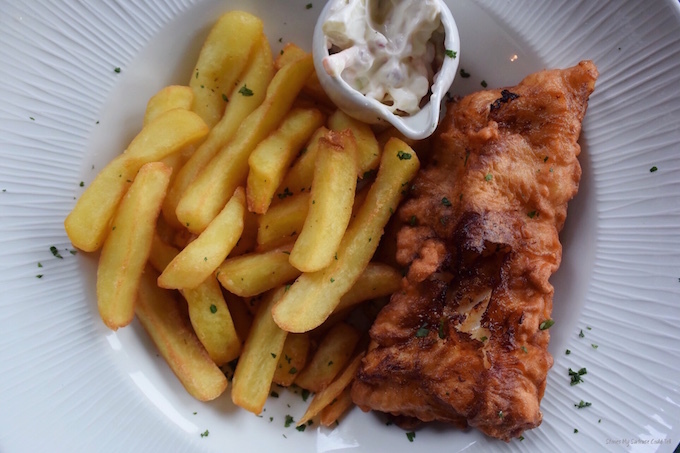 I’m glad to hear you liked the food as much as I do 🙂 The seafood in the islands is so fresh and delicious – fish and chips is always my first meal when I go home! Thanks Chris! 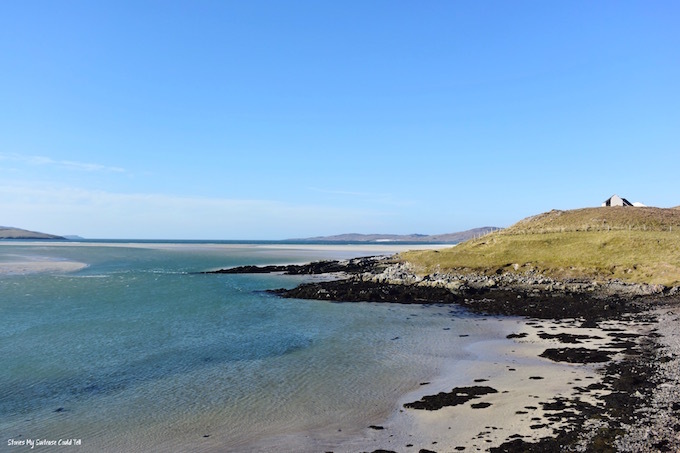 That’s a good piece of advice – when we got off the main road in Uist we passed some gorgeous empty beaches. 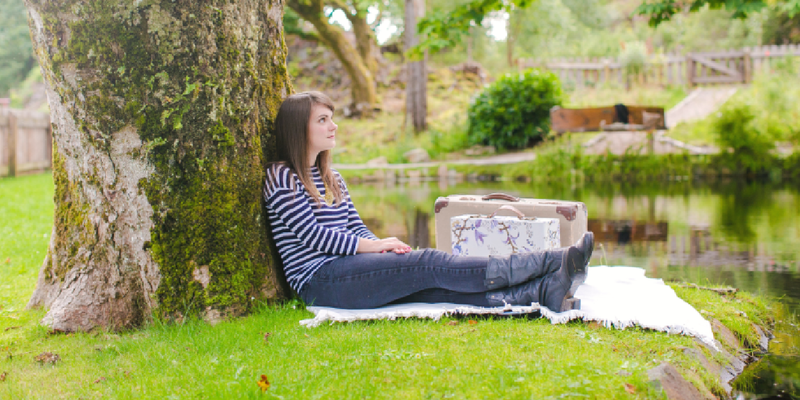 Oh you’ve captured the magic of the Outer Hebrides well Katie, and very practical too! I try and make sure to visit at least once a year and I’m starting to get itchy feet at the prospect. Totally agree that there’s plenty magic away from the main spots and North Harris is a particular favourite, along with North Uist’s Udal Peninsula. Hope you make it back soon! Thank you Katie for all your wonderful tips. My daughter + myself are visiting the Outer Hebrides in July and really looking forward to it. Your travel guide has helped me plan a head a little.